Two Crocks in One Week	Whistleblowers! Atty: Michael McCray joins TS Radio for some after election talk! The Associated Advertising Clubs of the World had officially adopted the slogan: “Truth in Advertising”, which turned out to be, as with all advertising, all political campaigns and various public relations trickery, just another bit of deception. The advertising industry had no intention of enforcing the empty promise. The promise of “truth” looked good to some naive consumers and probably influenced any number of folks, especially the gullible ones who had under-developed critical thinking skills. We consumers of heavily advertised products (that we may subconsciously desire but can usually get along without), are accosted hourly by clever commercials that are broadcast on our “free” television and radio programs. We can’t get away from it even when we surf the internet, when we idly page through our magazines or when we fritter away our time on our cellphones. Each encounter has an effect on our psyches – unless we are alert to the fact that some corporation or other is trying to sell us something. And whenever there is a political campaign happening (which in the US is essentially 24/7), prospective voters are accosted by partially true, squishy promises and sometimes vile verbal assaults from candidates who may be sociopaths, proto-fascists, serial liars or somehow never able to tell the whole truth about themselves, their real agendas or who their corporate paymasters are (whose hidden demands will necessarily be promoted if the bribed candidate is elected). Personally, I don’t recall ever being taught critical thinking or sales-resistance skills in my schooling, but I did acquire some by simply observing my very frugal and non-abusive parents, who provided my sister and I with our essential needs, tended a large backyard garden, bought no subscriptions to magazines, had no television and who listened to radio news programming that wasn’t sponsored by profit-driven corporations. I also grew up in a small rural Minnesota town that had very few shopping opportunities. Back then, thankfully, there was no such thing as a mall or a supermarket and there was nothing we ate that wasn’t already organic. The only shopping we were ever tempted to do was from the Sears catalog. Nobody shopped until they dropped and nobody frittered away valuable time diddling on cell phones. Baby boomer children in my era were rarely inoculated with vaccines, and although the ones we were given did indeed contain the neurotoxic metals mercury and/or aluminum , we never had multiple inoculations at one sitting. Instead, our mothers rushed to get us exposed to the many benign childhood infections such as chicken pox, measles and mumps whenever one of them appeared in town, and we then had lifelong immunity – no booster shots needed. Psychiatric drugs had yet to appear on the market when my immature blood-brain barrier was maturing – and there was no such thing as ADHD, autism, Asperger’s, bipolar disorder, premature dementia or even PTSD. And, although lobotomies, insulin shock and electroshock “therapies” were booming in America in the 1940s (wherever there were shock docs and insane asylums) we were protected by our geography. No such institutions were anywhere near my town. I grew up in the years between World War II and the American War in Vietnam, but I lived in an all-white Scandinavian town in safe, rural Minnesota that seemed to have no interest in the overseas fights against Germany, Italy, Japan, North Korea, China and North Vietnam. I was fortunate that my father had been too young to “serve” in World War I and was too old for #2, so Neither I, my mother or my sister were ever beaten by an alcoholic, combat-induced PTSD-victimized father. There was no authoritarian or punitive parenting in my family, no confusing war-related nightmares coming from my parent’s bedroom in the middle of the night and I had no parental chronic alcoholism to navigate. However, it was only much later in my adult life that I realized that I had been the victim of a subtle propagandizing in my childhood. Simply by reading the bland history books that had been approved by some school book committee down in uber-patriotic, pro-war Texas that I began to realize that I had been deceived by half-truths. I finally understood that my beloved nation was no triumphant, exceptional “shining city on a hill” like I had been led to believe. The religion I was accidentally born into, which endorsed every genocidal war its leaders started, was not superior to all the others. I realized that my teachers, my journalists and even my pastors had never gotten around to teaching me about the whole truth about America’s unethical, murderous, racist and genocidal military campaigns that started with Columbus and the conquistadors and continued with the mass killings of Native Americans and the theft of their homeland. And I was never taught the whole truth about the satanic nature of American slavery, the lynchings of innocent blacks or the cruelty of white supremacy and segregation after Lincoln had supposedly “emancipated” the African-Americans. Thanks to the political propaganda that drowned out every truth-teller, I never learned the whole truth of American imperialism, American racism, American militarism or American fascism. It took me decades before I finally realized that capitalism wasn’t the same as democracy! After all those decades of brain-washing, I am still working through the realization that I had been told thousands of patriotic lies about such things as the First Thanksgiving, the Revolutionary War, the War of 1812, the War Between the States and the Reconstruction Years that followed that war. It took me a long time to learn about the atrocities American soldiers committed in the Spanish-American War and in every war since World War II. And it took me a lot of study to realize that America and its CIA have been actively supportive of hideous right-wing military dictators throughout our recent history and, at the behest of sociopathic multinational corporations searching for cheap labor and unregulated markets for their goods, actually orchestrated the overthrow of a multitude of democratically elected national leaders. I never asked my (equally deceived and propagandized) history teachers when I silently wondered about the ethics of the Divine Right of Kings, the Monroe Doctrine, Manifest Destiny, Eminent Domain or the many US Supreme Court decisions like Dred Scott and Plessy vs Ferguson that supported white supremacy, slavery, the status quo and blatant racism. I’m sure that many folks of my generation (Baby Boomers) were victims of being told partial truths by teachers that we trusted. And we seemed to automatically trust the propaganda coming from politicians and opinion-leaders. In short, even though I regarded myself as being a critical thinker when it came to consumer purchases and politics, I have to admit that I have been bamboozled more times than I care to admit. Bernays was handsomely paid by major corporations and assorted front group institutions to cunningly convince consumers to buy their products. The groups included the Committee on Public Information in Woodrow Wilson’s administration to make the US entry into World War I palatable and getting Republican Calvin Coolidge elected to the presidency. In addition, Bernays was employed by General Electric, Procter & Gamble, ALCOA, the American Tobacco Company, CBS, and others. Bernays was hired by the American Tobacco Company in their efforts to expand market share for tobacco, by designing what is now called a “de-stigmatization campaign” to make cigarette smoking by women OK. The now infamous publicity stunt involved hiring a group of attractive flapper girls – each smoking a cigarette – to march down Broadway Avenue in New York’s 1929 Easter parade. He labelled the stunt the “Torches of Freedom” march. Bernays’ de-stigmatization propaganda campaign worked like a charm and within 2 or 3 generations, lung cancer has become a leading cause of death in American women. It worked like a charm. But what also has worked like a charm have been the multi-million dollar de-stigmatization campaigns from the Big Pharma front groups CHADD and NAMI that was begun and then heavily funded – to the tune of tens of millions of dollars per year – by all the big multinational psycho-pharmaceutical corporations like NAMI’s “Founding Sponsors” (Abbott Labs, Bristol-Myers Squibb, Eli Lilly, Janssen, Pfizer, Novartis, Smith-Kline Beecham and Wyeth-Ayerst Labs), whose successor corporations continue to annually fund the propaganda campaign. Interestingly, a highly paid ($750,000 per year) ALCOA attorney named Oscar Ewing had been appointed by Harry Truman to be head of the US Public Health Service in 1947. Ewing had been in leadership positions in the Democratic National Committee since 1940 and he had twice been a Special Assistant to the U.S. Attorney General. Obedient to the hidden agenda of the powerful aluminum industry, he and Bernays orchestrated a national fluoridation campaign that, over several years, fluoridated some 90 American cities. 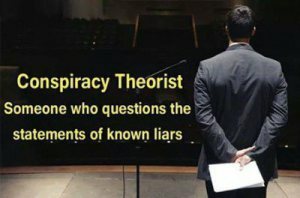 Opponents to the fluoride program that correctly suspected that there was a (now proven) conspiracy between industry and government were propagandized as “deranged”. Today they would be denigrated as “conspiracy theorists”. During the “Roaring 20s”, when the rigged stock market seemed to only go up, much of the impetus was provided by the public relations propaganda of Bernays and his colleagues that made the easily duped public somehow trust the sociopathic corporations and the equally sociopathic politicians that dominated the 1920s. The lessons learned from the mistakes of the administrations of Republicans Warren Harding, Calvin Coolidge and Herbert Hoover came hard – and too late. Those lessons came in the form of the Great Depression, when unemployment for the middle and lower classes reached catastrophic levels but were not all that bad for the elites in the upper 1%, whose large fortunes may have temporarily dwindled to small fortunes, money with which they bought up securities at bargain basement rates as well as foreclosed land, homes and businesses. The sociopathic German fascists Adolf Hitler and Josef Goebbels, both of whom were skilled serial liars and also anti-Semitic, were big fans of Bernays, who was Jewish. I end this column with a number of quotes about propaganda from some famous fascists who made “good” use of his writings. My hope is that readers will apply what can be learned from this piece to the propaganda that is happening all around them in both the political and corporate realms. Our democracy depends on it.